My ex-husband was and is ruled by anger. And in time, and through therapy, I learned that anger is a reaction to a feeling. That means that he could have been feeling frustrated, hurt, scared, disappointed, etc. and instead of acknowledging that feeling, he would react in a fit of anger. It is also very important to him that he always be right (stemming from his low self-esteem). And whenever I challenged his thinking, he would get angry and we would usually get into a fight. Now let me be clear, it’s not like we were debating philosophical ideals, politics, or religion where we could seemingly get into a heated debate. Our arguments would be over what actor starred in a certain movie, or what time a doctor’s appointment was the next morning, or something just as stupid. Trivial nonsense. One night we got into one of these arguments. I can’t tell you exactly what it was about because it was really stupid and didn’t matter. What I can tell you is that he ended up doing a google search about whatever we were debating and he realized I was right. This didn’t sit well with him and things quickly escalated into fighting and yelling. His anger was uncontrollable, which caused me to feel intense anxiety and panic. We were standing in the living room of our second-floor apartment going back and forth with each other. 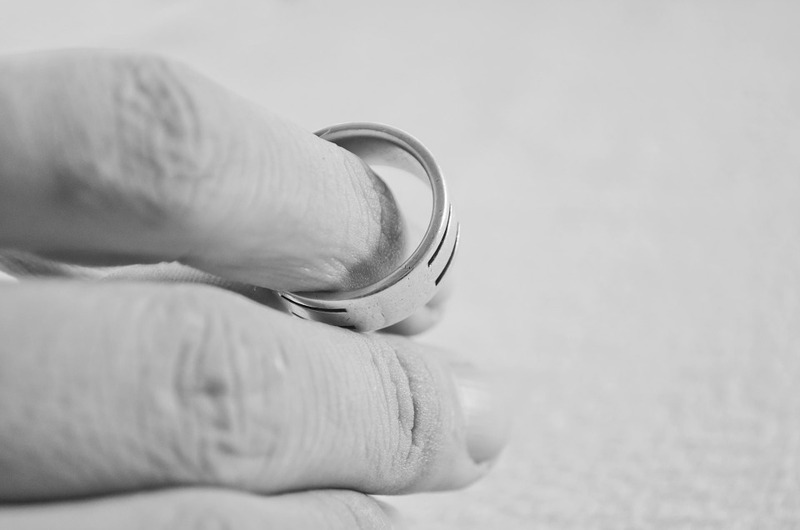 Ruled by his rage, he took his wedding ring off, opened our patio door, walked out onto the patio, and swung his arm back and threw his wedding band as far as he could into the grass. My eyes widened and I froze. I was devastated but numb to the actual pain I was feeling. It was kind of like how people that have been stabbed or shot don’t feel pain immediately because of shock and adrenaline running through their body. It was just like that. I was in shock. And then I foolishly reacted. I took my rings off and threw them on the ground in the living room. If he could throw his diamond wedding band off of our porch so carelessly then I surly didn’t want to feel mine on suffocating my finger. He picked up my diamond engagement ring and my diamond wedding band off of the floor, walked back out on the patio, and threw those into the grass, too. My adrenaline was gone. I dropped to my knees and began to hysterically cry. He continued to yell at me, but I couldn’t hear a word of what he was saying. I laid down on the hard-wood floor and began to hyperventilate. I was feeling hurt, scared, abandoned, anxious, desperate, confused, and a plethora of about a hundred other emotions. I still even hadn’t paid off our wedding or our rings, and he just threw them out into the grass. He was feeling no remorse, and continued his fit which led me to have a panic attack. I looked up at him, my face covered in water and said, “I can’t believe you threw our rings outside in the grass.” I began to cry again. My face looked so ugly staring back at me in the mirror. “I didn’t,” he said with a smirk on his face. WHAT? I was confused. What did that mean? I saw him two times go out onto that patio and throw our rings out into the grass. I wasn’t sure we would even be able to find them. I felt like I was going crazy. I couldn’t make sense of what he was saying. Was he lying? I looked over at him. He put his right hand down in the pocket of his basketball shorts. When he pulled it back out, he had his wedding ring, my wedding ring, and my engagement ring in his hand. The whole thing was a game, a rouse. Because he was wrong in our initial argument (and google said I was correct), he felt inadequate. And because he felt inadequate, he reacted in anger. So, he needed to do something to push me down, to make me feel bad, so he could feel better about himself again. It was reckless-and sad and pathetic. In the moment, I didn’t see that because I was being manipulated. All I felt was relief. Relief that he didn’t actually throw out $15,000 worth of jewelry, relief that he seemed calm and was no longer angry, relief that my panic attack has subsided, and relief that the whole argument was finally over. Looking back on it all, I have mixed feelings about how it all happened. I feel ashamed for stooping to his level and taking my rings off (We ended up agreeing after this fight that we would never take our rings off again, but as the title of this post suggests, he took his ring off much more than once.). I also know that I should have tried to end the argument, walk away – but in the moment, it was impossible. He acted like a child throwing a temper tantrum. This was a big game to him – a game of control where he used manipulation to get his way, where he would push me down to make him feel better about himself, and where he would exploit my anxiety. Hindsight is 20/20 so it’s much clearer to me now, but in the moment my emotions clouded my reality. His actions were premeditated; he knew exactly what he was doing. He knew each time he was pretending to throw those rings that he wasn’t going to actually do it. It was a way for him to regain control, and a way to make me lose control. It worked. I am going through a divorce and this post hits close to home. Your honesty is brave. Thanks for the feedback! Stay strong, it gets easier.